Twas the night before Christmas, and all through the house, the guests had grown peckish, the snacks had run out! 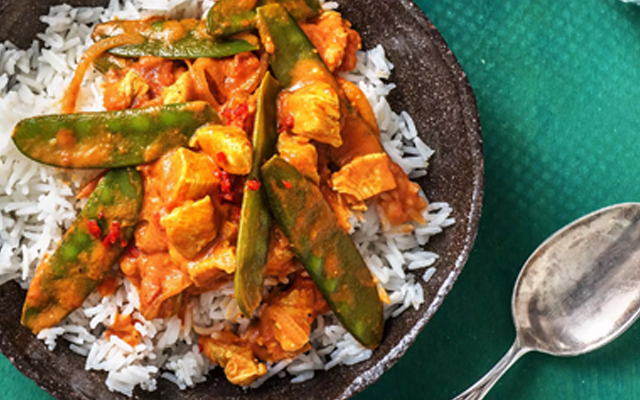 So the hosts quickly cooked chicken curry with care, a HelloFresh recipe for them all to share! Pair with a thirst-quenching gin cocktail. 1. Heat a drizzle of oil in a frying pan on medium-high heat. Once hot, add the diced chicken. Season with a pinch of salt and pepper. Stir and cook until browned, about 5 mins. 2. Add the tomato purée and Sri Lankan curry powder. Stir together and cook for 1-2 mins. Pour in the chopped tomatoes, 150ml water and stock powder. Stir to dissolve the stock powder and bring to the boil. Reduce the heat to low and simmer until the curry has thickened slightly, 10 mins. 3. While the curry bubbles away, halve the red chilli, deseed and finely chop. Do any washing up while you have a moment. 4. Once the curry has been cooking for 10 mins, add the mangetout. Cover the pan with a lid (or some foil) and simmer for a few more mins until the chicken is cooked through. 5. Taste and add more salt and pepper to the curry if you think it needs it. Fluff up the rice with a fork, and spoon into bowls. Divide the curry between your bowls, adding a sprinkling of chopped chilli for those who want a bit of a kick. Enjoy!